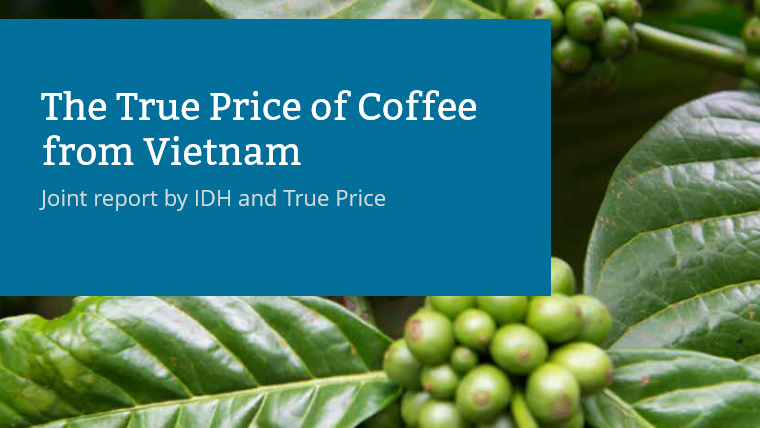 True Price and IDH, the Sustainable Trade Initiative are happy to announce the report The True Price of Coffee from Vietnam. This is a publication in a series of reports about the true price of soft commodities. The report quantifies the societal costs of coffee production in Vietnam. Key findings of the study include that 95% of the total external costs of cultivation are environmental costs, of which 28% are caused by scarce water use from over-irrigation. In addition, certified coffee has 20% lower external costs of cultivation than conventional coffee. The results are used to inform decision making in programs designed to contribute to more sustainable coffee supply chains. By making the external costs visible for all stakeholders engaged in the Vietnamese coffee supply chain, it is possible to identify interventions that reduce external costs. This study showed that most impact can be realized by (i) improving irrigation practices to reduce scarce water use, and (ii) improving fertilizer application rates to reduce water pollution and energy use. The external costs of cultivation are relatively low for green coffee beans compared to cocoa beans (Ivory Coast) and seed cotton (India), and slightly higher than for green tea leaf (Kenya). For more information on the true price of global commodities, click here to download the report. The production of soft commodities cocoa, coffee, tea and cotton leads to societal costs, such as underpayment of workers and soil degradation. One of the barriers for farmers, traders, retailers and consumers to reduce those costs is that they are invisible. For the first time, a public-private partnership with the world’s largest brands calculated what those costs are. Industry players can now use this information to reduce their costs with innovative projects, like agroforestry and yield improvement programs. This project, which has calculated the societal costs of commodities, is an initiative of IDH, the Sustainable Trade Initiative, a public-private partnership facility, which co-invests in value chains with private sector companies, and True Price, a social enterprise specialized in impact measurement and valuation. 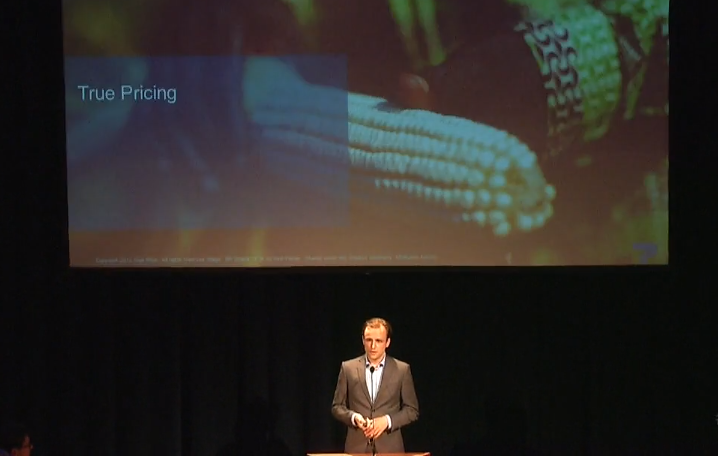 IDH and True Price looked at whether the production of commodities leads to external costs. These are hidden costs to society that are not yet part of current market prices. For social costs issues like underpayment, health and safety accidents, child labour, forced labour, gender discrimination, harassment and lack of freedom of association were considered. Environmental costs covered land use, air, soil and water pollution, energy and material use. By adding these costs to the sales price, a ‘true price’ was calculated. The first report released today, focuses on reducing the societal costs of cocoa from Ivory Coast, the world’s largest cocoa producer. Key findings include; the cultivation of sustainably certified cocoa beans results in a lower true price of about 15%. Improving yields and zero deforestation can reduce the true price further by about 30% and 5% respectively. The societal costs are considerably higher than coffee from Vietnam, tea from Kenya and cotton from India, which are calculated in upcoming reports. How generalizable are the results? The study had a limited scope as it was based on data from smallholder cultivation in Ivory Coast in 2014. Depending on data availability, averages were used and some societal costs could not be included. “Future impact research can improve the robustness of the results of this study and enhance future decision making around interventions and investment. 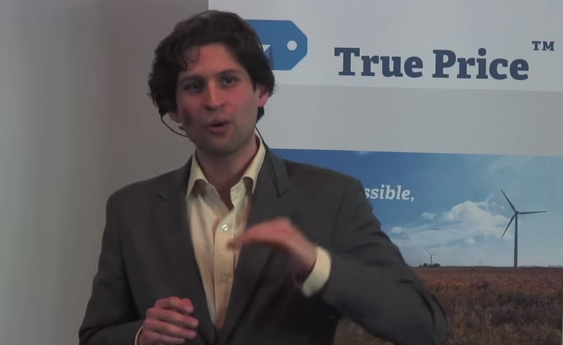 However, value chain actors can already use the information to structure their existing efforts to reduce external costs”, explains Adrian de Groot Ruiz, Executive Director at True Price. 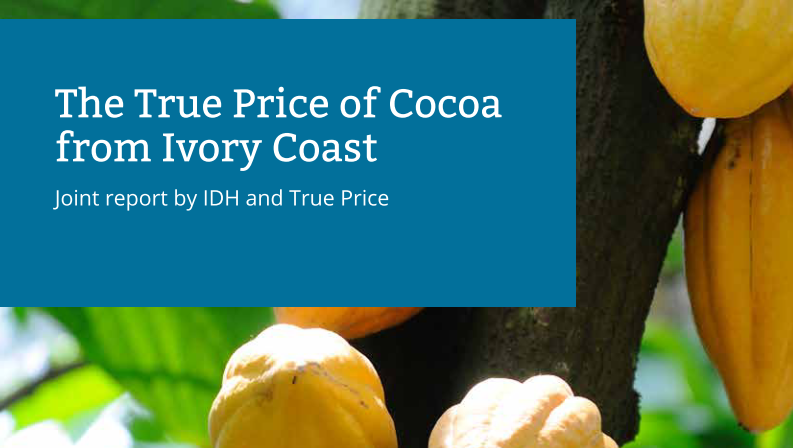 For more information on the true price of cocoa, click here for the report. Various themes are being discussed in the run up to the announcement of the post-2015 Sustainable Development Goals at the UN. Among them, impact measurement and valuation are recognized as tools for the realization of sustainable development. Three articles in the current zero draft refer to the measurement, reporting, improvement and pricing of impacts of the private sector. True pricing can play an important role in bringing to light what is needed to accomplish these goals by measuring and valuing environmental and social externalities. Michel Scholte, Director of External Affairs, presented the case for true pricing and the Sustainable Development Goals to Lilianne Ploumen, the Dutch Minister of International Trade and Development Cooperation. “The lack of true prices of products will hinder the achievement of the SDG’s”, Scholte said. The presentation was held at the debate: “Raising the Game: who pays for the new development agenda?” organized by Oxfam Novib and Vice Versa in Amsterdam on June 10. Watch the full presentation below. You find the contribution of True Price in the clip below at 50:36m and the response of the Minister at 1:05:43m (in Dutch). The meeting was organized in the running up of the negotiations of the Finance for Development agreement that will take place in Addis Abeba from 13-16 of July, in which the framework for the funding of the Sustainable Development Goals will be agreed on by international public and private sector stakeholders. "Change the world? Start a company!" Reading tip: our partner, Social Enterprise NL, has launched a book: ‘Social Enterprise Unraveled‘. It showcases social enterprises like Tony’s Chocolonely and Taxi Electric which are Dutch best practices, and also addresses the international context. The book is written by Willemijn Verloop and Mark Hillen.